Want to give it a go? Try our one hour taster lesson. 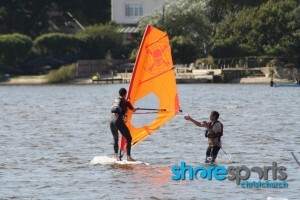 Windsurfing has often been seen as too hard to bother trying. With the modern equipment that we have at ShoreSports we can guarantee that we can get you up and going within the hour. All you need to do is bring your towel and swimwear and we will provide the rest, wetsuit, buoyancy aid, the lot.